We didn’t forget the cats! We have cat collars available in our Spectra-Glo and Kryptaglow lines as well as our Angel line which features an angels motif to help keep your angel safe. These unique collars can provide hours of enjoyment. 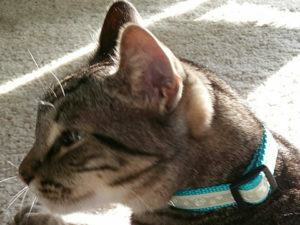 Turn off the lights and watch your cat cruise around with these unique glow in the dark collars. These collars charge in as little as 5 to 10 minutes but a prolonged charge for up to 30 minutes will really get it to glow. It will continue to glow for up to 12 hours in total darkness. Imagine – no more stepping on the cat when you get out of bed in the middle of the night. How about finally being able to see your black cat? You’ll have fun with this one!